i remember hearing about this cartoon that caused rioting in Iran which also led to the closing down of newspapers including the only state newspaper and the arrest of the cartoonist Mana Neyestani and his editor-in chief. when i saw Mana Neyestani's graphic novel at Edelweiss about his time in prison, i could not resisit downloading a copy. so what caused such rioting? blame the cockroach. the cockroach did it! A cockroach landed Iranian cartoonist Mana Neyestani in jail and turned his life upside down. Can a children’s cartoon cause riots? One of Mana Neyestani’s cartoons sparked riots, shuttered the newspaper he worked for, and landed the cartoonist and his editor in solitary confinement inside of Iran's notorious prison system. But that’s not the whole story. Neyestani exposes the complex interplay between art, law, politics, ethnic sensitivities, and authoritarian elements inside of Iran’s Islamic Republic. In his journey to escape imprisonment, the artist travels from Iran to Dubai, Turkey, Malaysia, all the way to China. Along the way he shines a light on the dangerous and convoluted measures taken by refugees in their attempts to find safety and freedom. Mana Neystani’s story is at once unique, universal, and truly Kafkaesque. 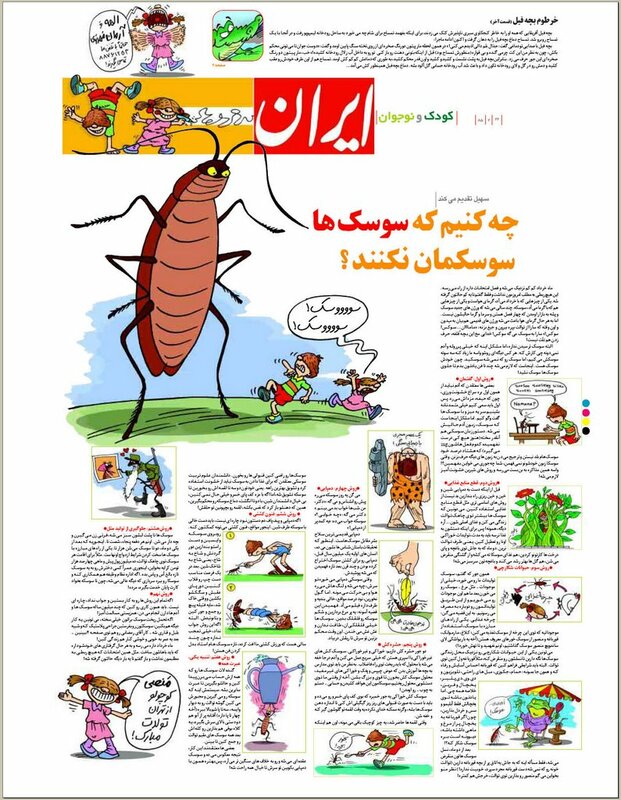 "the controversial cartoon that depicted the Azeri people as cockroaches"
*for those interested, An Iranian Metamorphosis can be downloaded directly from Edelweiss. no waiting for requests to be approved.